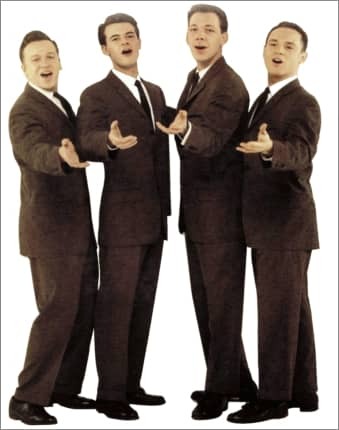 Canada, were one of the most popular singing groups of the 1950s. This versatile group was signed to Mercury Records and was designated to cover the recordings of black artists, as was often the practice in those days because many radio stations wouldn't play the recordings of black artist. Proving they were up to the task, they put 16 hits on the charts of Billboard, three going gold: "Little Darlin", "Silhouettes" and "The Stroll". They even showed up on the R&B charts. Group members were David Somerville, lead; Ted Kowalski, tenor; Phil Levitt; baritone; and Bill Reed, bass. Kowalski and Levitt were students at the University of Toronto, Somerville was a radio engineer at the Canadian Broadcasting Corp. (CBC) and Reed was employed by the telephone company. In the fall of 1953 Somerville met this unnamed group in the hall of the CBC. The group was in its original form, with Stan Fisher as lead singer, and they were going to audition for a CBC show called "Pick the Stars". Being a trained singer and looking for a group to be involved with, Somerville offered to tutor the guys and help them along. He got them practice time in "unoccupied" studios and also had connections for professional arrangements. Thing were moving along until the group was scheduled to sing at a Christmas party at a local church. As it turned out, lead singer Fisher opted out to study for an exam the next day. Since Somerville knew all the songs, he took the lead--literally--and the group was an overwhelming success. The decision to go professional came quickly. Fisher decided not to continue with the group. With their new lead Somerville, The Diamonds were about to hit the scene. They, like most artists of that day, were not an overnight success. They worked hard, developing their craft, even learning "barbershop quartet" singing from Bill's dad, also a bass singer. Whenever possible they would get together with a black gospel group called The Revelaires, from Detroit. As The Diamonds have said, "This was the group that had the most effect on our singing; they taught them not to be so square". The group wanted to get serious about their singing so Dave's connections introduced them to Nat Goodman, a professional classical musician who took the group under his management. It was at this point that all members had suspended school, quit their jobs and the group began to polish their repertoire. With a performance and a win on the Arthur Godfrey show Talent Scouts, and a week guest-starring on Godfrey's radio show, they soon were signed to a four-song contract with Coral Records. A later introduction to Cleveland disc jockey 'Bill Randle', got them a long-term contact with Mercury Records. In 1956 they had four charted hits before their 1957 hit, "Little Darlin'". This was the song that made them a household name. It also landed them in the teen musical The Big Beat (1958), and they also sang the theme song for the films Kathy O'(1958) and The Horizontal Lieutenant (1962). Their contract with Mercury produced over 60 singles, three original albums and several compilation albums. Even today they still pop up on a soundtrack from a movie. 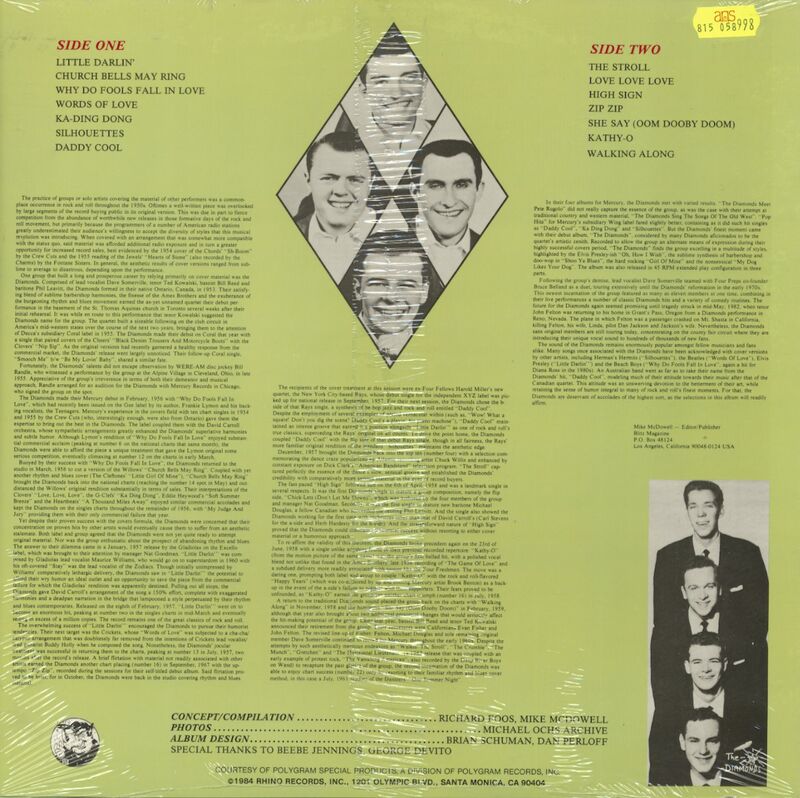 By 1961 all the original members had left the group, but The Diamonds still continued. The original members would get together for an occasional oldies reunion, but it wasn't until an appearance in the 2000 Public Broadcasting Service production of “Do-Wop 51”. (2001) did they once again gain national attention. That was followed with an appearance in another PBS special, Magic Moments: The Best of 50's Pop (2004). and another “More Magic Moments the Best of '50s Pop”. That was the last performance with the original four. Members during their Mercury contract: David Somerville, Ted Kowalski, Phil Levitt, Bill Reed, Mike Douglas, John Felten, Evan Fisher, Jim Malone. - Other members over the years: Glen Stetson, Bill New, Bob Duncan, Steve Smith, Gary Cech, Joe Denis, Jerry Honeycutt,( Gary Owens, Sean Sooter, Jerry Siggins, Jeff Dolan. (The last four listings are the current members of The Diamonds). 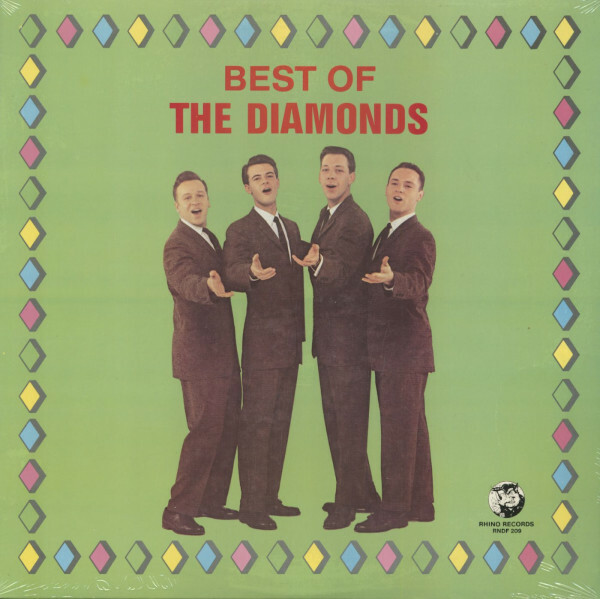 Kundenbewertungen für "Best Of The Diamonds (LP)"